Before we get into the thick of things, some housekeeping. 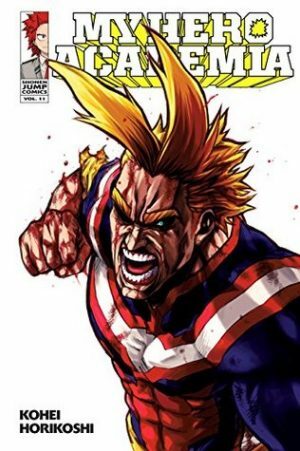 If interested, check out the review for My Hero Academia Vol. 10 here. Also, do be aware of spoilers. It is nearly impossible to talk in any great detail about the eleventh volume of something without venturing into possible spoiler territory. If you aren’t caught up with the manga volumes or don’t keep up with the chapters released in Shonen Jump, do be warned. The story picks up right where it left off in volume 10 and wastes no time getting into things. All Might and the other pro heroes are in the midst of a rescue attempt, trying to get Bakugo out of the hands of the League of Villains. Meanwhile, Midoriya, Todoroki, Kirishima, Iida, and Yaoyorozu are hiding, also on the scene after trying to sneak into the enemy’s hideout in order to rescue their classmate themselves. Things go from bad to worse very quickly as Tomura’s mentor, the true leader of the League of Heroes, enters the scene. All Might must face down his sworn enemy, All for One. The tension is dialed up to 11 from the very beginning of the manga. We are the middle of Bakugo’s rescue. On one side are the heroes desperately trying to rescue Bakugo and keep the chaos and collateral damage down to a minimum. On the other side are the villains, doing whatever they possibly can to keep both Bakugo and themselves out of the hero’s hands. Both sides begin to get desperate. This fight scene is fantastic, and not only because we get to see the No. 1 hero and the No. 1 villain duke it out. We see All Might in a much different light here than we normally do. He loses his cool. He needs the words of his own mentor to help him focus. Even his fighting style at the end shows the influence of those around him, particularly of Midoriya. Now, I’m sure I’m late to the party on this one, but the long fight scenes with All Might vs All for One brought something to my attention. Whenever All Might is fighting, the manga’s entire layout changes. It is a slight change, something easy to miss, but something important. Instead of the usual grid-like, symmetrical cell formatting of manga, we instead see the slightly chaotic style of American superhero comics. Cells are diagonal, or else simply slanted on the page. Sometimes there are no cell boarders at all. Characters sometimes burst from the frame of one cell and into the white space between them, or into another cell entirely. This isn’t anything new to the manga, either. After a quick flip through previous volumes, I can say with certainty that this occurs whenever All Might is fighting. But it isn’t something I picked up on previously. Perhaps it’s because I do read a lot of American comics and graphic novels, but this always looked ‘normal’ to me, and only became apparent when All Might fought continuously for so long. The rest of the manga deals with both U.A. attempting to deal with the fallout from being attacked by villains twice and having a student kidnapped as well as the students themselves trying to get things back to normal in their own way. While certainly less tense than the first half of the volume, the rest isn’t without its own ups and downs. Focus is put on character relationships and character development. Most prominent is Bakugo’s character development. We see him ready to fight, holding himself very impressively, All Might’s smile in the face of danger on his face, even as the rest of his classmates cower in terror in the presence of All for One. More importantly, we see him softening. For the first time, we see him thank someone. On top of that, he states that it’s alright if All Might keeps secrets for him, even though it’s obvious he suspects something. Though Bakugo has been slowly changing since he was first introduced in volume 1, this is probably the most overt example his character development. Midoriya’s mother, Inko, is seen more in this chapter than maybe the rest of the manga combined. We finally get to hear what she thinks of her son’s time at U.A., the villain attacks, and even All Might himself. This is a pretty tense chapter, and unexpectedly so. But it also marks some important things. It isn’t often that parents are even acknowledged in manga, let alone having their opinions about their children fighting evil and being in constant danger voiced. I really liked this aspect of the volume. Not only do we get to see what she thinks about the last arc, but we see her interact with All Might. There’s great respect on both sides here. All Might respects Inko’s opinion and feelings, going so far as to state that she reminds him of his own mentor. But Inko also respects All Might, and gives him the words and encouragement that no one else has given him. I found their interactions especially interesting after All Might’s phrasing earlier in the manga. When he speaks about needing to live in order to guide Midoriya, he says nothing about training or teaching. The phrase he uses is ‘raise’. This, I think, speaks volumes to their relationship, and seeing him interact with Inko only solidifies this. The volume winds down with some lighthearted fun. We get to spend some down time with class 1-A, getting to learn more about them through an impromptu ‘room competition’ of sorts as they move into the dorms at U.A. This was pure, simple fun, and a good way to round off the volume. Seeing the whole class interact is always highly entertaining, and this short section definitely ended volume 11 on a high note. My Hero Academia Volume 11 was a roller coaster of emotions, at once a tense ending to a fantastic arc but also with lighthearted antics and plenty of character development. This was a fantastic volume that I could talk at length about. But those are more in depth discussions for another day. This is definitely not a volume you’ll want to skip, and if you’re planning on watching season three of the anime in April, I’d suggest catching up on the manga first.